In the Fall of 1988, Chief of Police Dennis Nichols sent then-patrolman Steve Adams to a one day preview of the D.A.R.E. program presented for local-area lawenforcement agencies by the Tulsa Police Department. After spending the day seeing the program first hand, Chief Nichols made the decision to train a Pryor Police Department officer to present the D.A.R.E. program to the children of Mayes County. Patrolman Steve Adams was selected to attend D.A.R.E. officer training in Tulsa in the Fall of 1988. After a rigorous two weeks of training, Ptl. Adams came back to Mayes County and began a 23-year run as the D.A.R.E. officer for the Pryor Police Department. For the first three years, the program was presented to six school districts in Mayes County, Oklahoma: Pryor, Osage, Chouteau, Locust Grove, Salina, and Adair. In the 23 years that the D.A.R.E. program has been in existence in Mayes County, over 6,500 5th graders have been given the tools needed to combat the pressures thrown at them to start using alcohol and drugs. Sgt. Adams made the decision to retire in August of 2012. Since his departure, Ptl. Jeremy Cantrell has stepped in and become Pryor's newest School Resource Officer/D.A.R.E. Officer. Officer Cantrell is happy to take on this new assignment, and has already obtained D.A.R.E. instructor certification. Sgt. Adams worked very hard throughout the years educating the youth in our community about the dangers of drug and alochol abuse, as well as peer pressure; Officer Cantrell hopes to build upon the foundation that Sgt. Adams worked so hard to build. This year millions of school children around the world will benefit from D.A.R.E. (Drug Abuse Resistance Education), the highly acclaimed program that gives kids the skills they need to avoid involvement in drugs, gangs, and violence. D.A.R.E. was founded in 1983 in Los Angeles and has proven so successful that it is now being implemented in 75 percent of our nation's school districts and in more than 43 countries around the world. D.A.R.E. is a police officer-led series of classroom lessons that teaches children from kindergarten through 12th grade how to resist peer pressure and live productive drug and violence-free lives. Ptl. 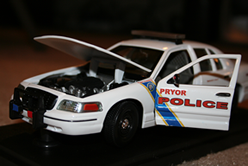 Jeff Mitchell has been a patrolman with the Pryor Police Department since 1998, and since 2006 has been a D.A.R.E. Officer. Ptl. Mitchell and Sgt. Adams educate children in our community about drug and alcohol resistance, how to combat peer pressure, and encourage them to maintain a healthy lifestyle. Ptl. Mitchell is the handler for our canine officer, Rambo. Click here to read more information about our canine unit.